Leo II (or Leo B) is a Mount Wilson and Palomar Observatories in California. In 2007 a team of 15 scientists observed Leo II through the 8.2 meter Subaru optical-infrared telescope in Mauna Kea, Hawaii. Over 2 nights, 90 minutes of exposures were taken and 82,252 stars were detected down to a visible magnitude of 26. They found that Leo II consists largely of metal-poor older stars, a sign that it has survived the galactic cannibalism under which massive galaxies (e.g., the Milky Way) consume smaller galaxies to attain their extensive size. Observation at ESO estimates Leo II's mass to be (2.7 ± 0.5)×107 M⊙. Local Group, a description of the group of galaxies that includes the Milky Way. ^ a b c d e f "NASA/IPAC Extragalactic Database". Results for Leo B. Retrieved 2006-11-18. ^ I. D. Karachentsev, V. E. Karachentseva, W. K. Hutchmeier, D. I. Makarov (2004). "A Catalog of Neighboring Galaxies". Astronomical Journal 127 (4): 2031–2068. ^ Tollerud, E.; et al. (Nov 2008). 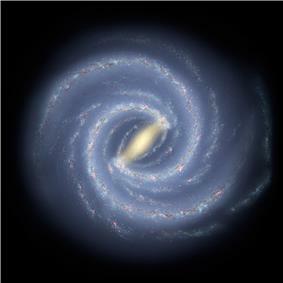 "Hundreds of Milky Way Satellites? Luminosity Bias in the Satellite Luminosity Function". Astrophysical Journal 688 (1): 277–289. ^ Coleman, M.; et al. (Nov 2007). "A Wide-Field View of Leo II: A Structural Analysis Using the Sloan Digital Sky Survey". Astronomical Journal 134 (5): 1938–1951. ^ "Leo II: An Old Dwarf Galaxy with Juvenescent Heart". National Astronomical Observatory of Japan. 28 Nov 2007. Retrieved 25 Nov 2008. ^ Andreas Koch; et al. (August 2007). "Stellar Kinematics in the Remote Leo II Dwarf Spheroidal Galaxy—Another Brick in the Wall". Astronomical Journal 134 (2): 566–578. Harrington R. G.; Wilson A. G. (1950). "Two New Stellar Systems in Leo".